The pressure generated by rising demand, increasing delivery costs, and funding cuts has already led to a long running crisis in housing, and the more recently acknowledged crisis in adult social care. The next core service area to join the critical list as a result of acute financial pressure will be children’s services unless swift and decisive action is taken at this budget to stabilise it. London boroughs are experiencing acute and intensifying pressure on children’s services budgets, including shortfalls in funding across both children’s social care and high needs block. For many boroughs, dealing with the pressure on children’s services budget is a greater and more immediate challenge than Adult Social Care. Children’s services funding is an urgent priority for London local government and will only continue to rise up the national agenda as demand pressures grow. A recent survey of boroughs found that 27 out of 30 boroughs experienced overspends in children’s social care budgets in 2016/17, averaging £3.5 million per borough. 95 per cent of aggregate overspends are accounted for by spend on placements and core staffing, which make up 71 per cent of aggregate budgets. London Councils continues to have considerable concern about the insufficient level of funding provided for pupils with Special Educational Needs (SEN) through the high needs block of the Dedicated Schools Grant (DSG). Schools have experienced significant financial pressures over the past few years and London Councils’ modelling estimates that the total cost pressures on schools in England will be around £5.6 billion between 2017/18 and 2021/22. As such we welcome the announcement by the Secretary of State for Education that the core schools budget will increase by £1.3 billion in 2018/19 and 2019/20. We also welcome and the commitment to ensuring that no school will lose out in cash terms as a result of the introduction of the National Funding Formula (NFF). The additional investment in the schools budget will be vital in supporting London’s schools to build on their current performance and continue to improve standards. London Councils’ annual report on the pressures facing the school places planning system in London, Do the Maths, predicts a shortfall of 63,710 places across schools in London over the six year period to 2022/23. 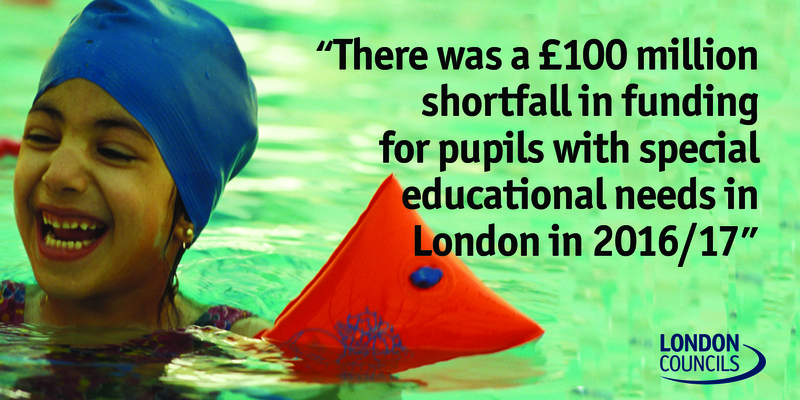 To meet this shortfall in mainstream school places London requires an estimated £1.6 billion. Basic need allocations have been published for the first three years of this timeframe. These confirm that London boroughs will receive around £600 million through Basic Need between 2017/18 and 2019/20. This suggests that, according to current projections, a further £1 billion of funding will be required – either through the basic need grant itself or through the creation of new free schools in areas of demand – to meet the shortfall. School places for children with SEND are significantly more expensive than mainstream places. The average cost of creating a dedicated SEND school place in London is £69,055, around three times higher than the cost of a mainstream place. The introduction of 30 hours a week free childcare for eligible working parents of 3- and 4- year olds will increase existing pressure on delivery and capacity in the childcare market.